Liverpool John Moores University Vice Chancellor, Proffesor Nigel Weatherill, and the Director of the Instituto de Astrofisica de Canarias (IAC), Proffesor Rafael Rebolo López, have signed a Memorandum of Understanding to explore the design, construction and operation of the new 4.0 metre telescope which will be on a bigger scale than the current Liverpool Telescope (LT) which has been studying the cosmos and making discoveries for over a decade. The new telescope will be built on the Spanish Canary Island of La Palma and be 4 times more sensitive and 10 times faster to respond to unexpected celestial events than the current world record holding 2-metre LT, also based on La Palma. The rapid response and the capacity to programme the observations flexibly from a distance make large robotic telescopes powerful tools for studying variable objects such as supernovae, gamma ray bursters, exoplanets and binary stars. This type of studies will grow substantially in the coming decades, and the new 4 m telescope will be more essential for exploring the universe than ever before. According to Professor Iain Steele of the Astrophysics Research Institute (ARI) at LJMU: "This is the perfect moment for this agreement. As the new international installations which will make the next decade's great discoveries come into operation, such as the gravitational wave detectors LIGO and Virgo, and the Large Synoptic Survey Telescope we will urgently need a telescope with high sensitivity spectroscopic performance. The LT2 will be the ideal instrument to do this job". "The new optical telescope will identify hundreds of exceptionally interesting sources per year, from black hole binary stars to supernovas, and the sources of gravitational waves which we will also be able to characterize in great detail with the Gran Telescopio CANARIAS. The two telescopes are clearly complementary" stated Rafael Rebolo. Professor Chris Collins, director of the ARI, said: "This is a great opportunity to extend to cosmological distances the excellent science which is at present being carried out with the Liverpool Telescope. H added "Research into the exotic physics which drives the processes in many highly energetic distant sources, using data from the new 4 m robotic telescope, with its rapid response, will keep us busy for the next few years". As well as being a leading scientific project at world level, in the design and construction of LT2 new technology will be employed in advanced materials, optical design and control systems. The close relationship of the ARI with the Faculty of Engineering and Technology (FET) of LJMU and the leadership of the IAC as a centre of technological development in astronomy puts the two institutions in a unique position to supply the technology which will be needed for this project. The project is in its initial design phase and could be of interest for research centres, universities, and companies who want to enter a technological sector which will expand significantly in the coming decades. For Johan Knapen, researcher of the IAC, "the project builds on the hugely successful collaboration between LJMU and the IAC in building and operating the LT, which has been making discoveries for a decade. We look forward to working closely with LJMU in this project, which is of the highest calibre both technologically and scientifically." 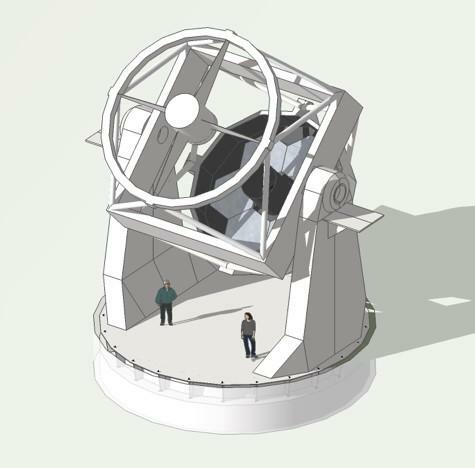 The new telescope is also of great interest for the IAC's educational projects with robotic telescopes (PEteR), and for LJMU the National Schools' Observatory (NSO). Currently, these projects give Spanish and British school students, respectively, free acces to the Liverpool Telescope. In the future, it will will expand to make use of the new telescope, creating an unrivalled opportunity to enthuse a generation of children about science, technology, engineering and mathematics.